Dr. Ganesh had the good fortune to accompany his Guru Shri. Maharajapuram Santhanam’s Vocal Support. In most of his concerts in India from, August 1987 till June 1992 including the one at Swami Dayananda Matriculation School, Manjakkudy on 23rd June 1992 which happened to be the last concert of the Great Maestro. After 1992, he has been giving individual music concerts throughout India. He has been performing in leading music institutions in India and abroad. He had the golden opportunity to perform in the divine presence of Bhagwan Sri Sathya Sai Baba at Prashanthi Nilayam, Puttaparthi on the eve of his 70th birthday celebrations in November 1995. He is a regular performer and an artist with grade ‘A’ in All India Radio and Doordarshan. In July 2002, for the International Conference of Siva Bhakthas held at Seerani Arangam, Chennai he gave a novel programme titled "SIVA HAARAM" wherein he rendered "OM NAMASIVAYA" in 108 ragas. He has number of audio cassettes to his credit. He has visited South Africa, Australia, Malaysia, Singapore & Dubai and has presented concerts. Dr.R.Ganesh born in the year 1968 and belongs to the lineage of Great Composers - Sri Kavikunjara Bharathi and Shri Koteeswara Iyer. Ganesh started his training in vocal carnatic music at the age of 10 from Shri.P.Mahalinga Iyer at Thanjavur and later, from Vidwan. Thirukkarugavoor Shri.G.Srinivasaraghavan. He had advanced training through the traditional "Gurukulavasa" system from the Great Maestro Padmashri Sangita Kalanidhi Maharajapuram Shri.Santhanam for six years. Presently, he is continuing his training under Vidwan Shri.O.S.Thiagarajan. He also learnt Veena from Vainika Vidwamsini Smt.Ranganayaki Rajagopalan of the Great Karaikudi Sambasiva Iyer School for few years. Ganesh accompanied his Guru Shri.Maharajapuram Santhanam as Vocal Support in almost all his concerts in India from August 1987 till June 1992. Dr.R.Ganesh is a Registered Veterinary Practitioner, and is being supported by the presitgious Viswapriya Group which has placed him as Chief Manager in Chennai. 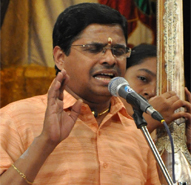 He is a recipient of numerous awards and titles "The Maharajapuram Memorial Prize" in 1993, "G.R.Chari Memorial Prize", "Sangitha Chinthamani", "Yuva Kala Bharathi", "Shri Nataraja Iyer Memorial Award", Young Male Vocalist" by The Music Academy, "The Best Vocalist Award in Sub-Senior Category" by The Indian Fine Arts Society "Gnana Sangeetha Mani" title by Guhashri Swamigal Satsangam, “Isai Arasar” and the Youth Excellence award for Vocalist by Maharajapuram Viswanatha Iyer Trust.